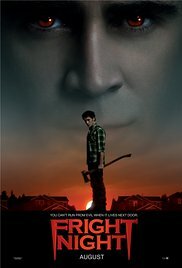 After a new neighbor moved into the house next door, Charley discovers that he is an ancient vampire and goes in search for the help of Peter Vincent, a famous “vampire killer” to save his neighborhood from the creature. Vampires …. They never appealed to me. For me, they are annoying biting creatures. And the fact that they haven’t yet discovered the beneficial effects of a well-covering sunscreen factor 100, says enough about their IQ. Never mind. I think I’ve seen the original long time ago. But I can’t really remember anything of it. When I look at this remake, I noticed first that the SE’s aren’t very up-to-date for this time. In addition, in my opinion those vampires looked a lot like Critters. For me, Collin Farrell as the cool play-boyish vampire and David Tennant as a Las Vegas show beast who transformed into the ultimate vampire connoisseur and fighter, scored high points. Anton Yelchin’s performance is below par in comparison with that what he showed in “Odd Thomas”. His girlfriend in “Odd Thomas” was a better treat than Poots here. It’s also incomprehensible that he ignores her advances and is more interested in spying on the neighbor. Those teenagers of today! The little supporting roles of Dave Franco and Reid Ewing were entertaining. Two super cool high school boys. Cool but dumb at the same time Especially Ewing with his 2-syllable murmuring.